Monitoring water quality for inland and coastal waters is a requirement for many government and private sector entities. This requirement includes identifying long-term trends and understanding emerging problems over large areas that contain numerous water bodies â€“ all to be done in near real time. To satisfy this requirement EOMAP GmbH & Co. KG, a leading provider of aquatic remote sensing solutions, has now launched the world’s first harmonized, high-resolution monitoring service for inland and coastal waters, with water quality information directly accessible online through the eoApp web application. The service is supported by data from a fleet of satellite sensors and uses proprietary, state-of-the-art physics-based processing technologies. The base product suite includes water quality parameters such as turbidity, chlorophyll concentrations and organic/inorganic components, all delivered and displayed in digital map form. These information products and services can be generated for any location worldwide. These products and services are standardized, inter-comparable and independent, and do not require any form of ground truth data. “Our remote sensing-based service sets the new standard for monitoring inland water systems, of almost any size, in their entirety, regardless of geo-political boundaries – at very competitive rates – with sampling frequencies of daily to weekly and at spatial resolutions of 2 m, 30 m and 500m”, explains Karin Schenk, head of EOMAP Water Quality Services. EOMAP has received several awards from the COPERNICUS programme of the European Commission and ESA (European Space Agency) for its work on making affordable aquatic remote sensing products available to industry and the public sector. Indeed, the EOMAP eoApp Web application provides an easy access to spatial water quality information and enables detailed time series analysis going back for decades in time. 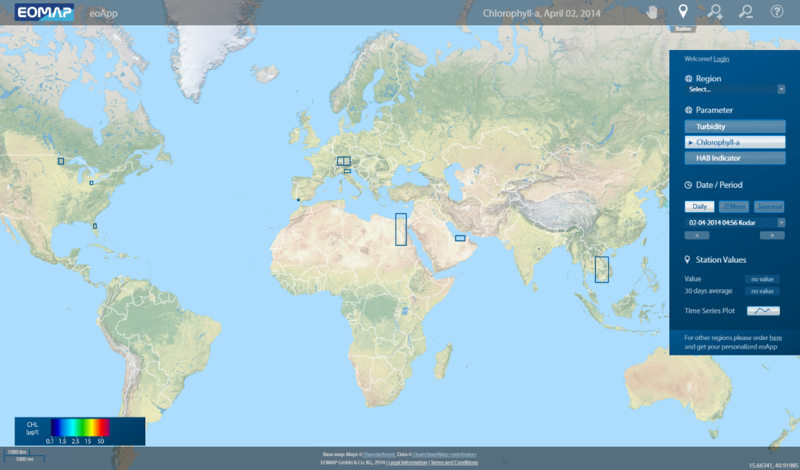 Published online on http://eoapp.eomap.com, eoApp displays water quality data examples from various countries and continents (Europe, Africa, Asia, Australia, North and South America) and demonstrates the harmonized and global coverage of the service, covering thousands of lakes, dams and rivers. â€œThis entrepreneurial spirit and drive of innovation fosters the sustainable market development for space-based services, in particular those relying on precise and easy accessible earth observation data. It is exciting to realize that the EOMAP technology is also ready to immediately incorporate the current and future Sentinel satellites into these operational servicesâ€ added Dr. Thomas Beer, Copernicus Policy Coordinator at European Space Agency. Since the satellites used are already operating with global coverage, this new EOMAP inland water quality monitoring service is ready to be deployed worldwide, whether at local, regional or even continental scales. â€œWith our new service, harmonized water quality information has never been easier and faster to access or incorporate into the business workflows of water agencies and industries such as dredging, desalination or aquacultureâ€œ, said Dr. Thomas Heege, EOMAP CEO. â€œAccess and analysis of aggregated global water quality information, whether through the easy-to-use eoApp Web application or delivered directly into a user’s information environment, enables an improved understanding and management of all inland waters, which ultimately are so important to both our environment and society”.